Visible from Glastonbury Tor to the north-west, Cadbury Castle is the site of an Iron Age hill fort, as well as being the most likely site for Camelot. During the fifth century in Britain, it was probably located close to the borders of Caer Gloui to the north, Caer Gwinntguic to the east, and Dumnonia to the west, and was more than likely just within Dumnonia's borders. Lying above the village of South Cadbury, the site shows signs of Neolithic visitation, and was inhabited regularly from the Late Bronze Age onwards. There was never a castle here in the traditional sense, but the hill fort site was defended by earthwork ramparts and ditches. These were created around 400 BC by the local tribe, probably the Dumnonii before they were pushed further west by the arrival of the Durotriges tribe. 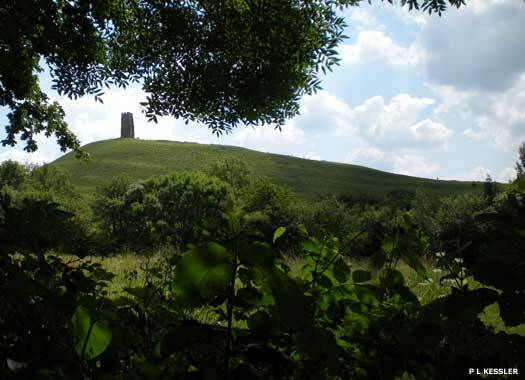 The hill fort consists of four huge ramparts and an enclosure that rises to the plateau which is roughly level with the summit of Glastonbury Tor. Beyond the Tor is another hill fort, Brent Knoll, and in a straight line leading across the Bristol Channel is the hill fort of Dinas Powys (in Cernyw), all four of which are in a more-or-less straight line. They probably formed part of a chain of communications before the coming of the Romans. Part of the summit of the enclosure has been badly chopped up by medieval ploughing, and archaeology presents itself in a jumble of odds and ends of various periods, but it is copious archaeology, showing everything from flints and pottery shards to high quality non-British ware for wine or oil which was imported from the eastern Mediterranean. The Tudor traveller John Leland stated in 1542 that the hill fort had been the headquarters of Arthur, and he seemed to be relating a long-held local tradition that the site was 'Camallate or Camalat'. Some think that the claim is simply due to the nearby village of Camel, but Leland's spelling with an 'a' as the last syllable may echo a local pronunciation that can still be heard, with the 'a' as in 'car' in a southern English accent. It sounds very similar to 'Camelot'. The tradition that Arthur lies asleep in a cavern closed with iron gates, waiting to emerge at the moment of the country's deepest need, is also tied to Cadbury, as the cavern is supposed to be underneath the hill fort. There may actually be a silted-up cave in the scarp on the south of the plateau. On the left of the ascent is Arthur's Well, while the highest part of the plateau has been Arthur's Palace since at least 1586. Arthur was the 'battle-leader' of the late fifth century Britons and a candidate for a Romano-British high kingship. 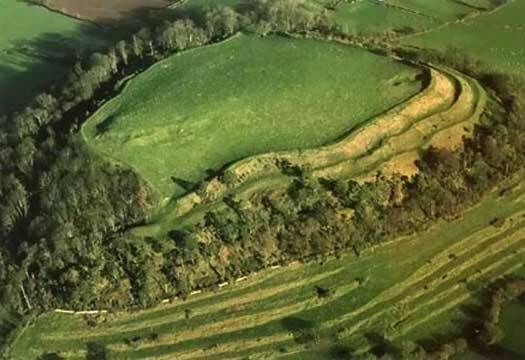 The reoccupation of the hill fort in the mid-fifth century AD was of a scale that could only be undertaken by a prominent leader, such as a regional king or a high king, so Arthur or his predecessor must be prime candidates. A small river, the Cam, flows between Cadbury and Sparkford. This has been proposed as the Camlann, the Crooked Bank, of Arthur's last battle. Absurdly, those resistant to the idea of Camelot itself, let alone a belief in the existence of Arthur, continue to persist with the notion that Cadbury's paths and terraces were formed by natural geological causes, or medieval agriculture, or anything else but the most obvious cause. Other hill forts in Britain were also reoccupied, but so far nothing has appeared on such a grand scale of refurbishment and rebuilding. A few examples in British and Pictish territory in Scotland are smaller, especially the British ones, and none have a gate house. Cadbury remains a unique example of post-Roman hill fort use. Cadbury Castle is stormed and captured by the invading Roman legions. Its late occupation in Durotriges tribal territory approximately two decades after the tribe has been conquered by Rome is a bit of a puzzle, but not if it figures as part of a last gesture of defiance at the time of the Boudiccan rebellion by the Iceni tribe. The possibility exists that a chief of the Durotriges, chaffing at the loss of his domains to these invaders, jumps at the chance to oppose them again in the true spirit of a British warrior. After the final battle, the inhabitants are resettled at the base of the hill fort. Occupation of Cadbury Castle is re-established after about four centuries of disuse, perhaps selected not only for its defensive capabilities in these troubled times but also because it had been a British Masada, the scene of an heroic last struggle. Its reoccupation is not in the form of a city or an established seat of government for successive rulers. Instead it seems to be a place that a British leader of stature, perhaps Arthur or his immediate predecessor, Ambrosius Aurelianus, makes his personal headquarters. Intriguingly, archaeology later discovers near the south-east bend of the top rampart a human sacrifice, a young male skeleton rammed head-downwards into a pit with further rampart building on top. The purpose of such a sacrifice, this one occurring before the arrival of the Romans, would be to add supernatural support to the wall, and the tradition of Merlin sees him introduced as an intended sacrifice for the very same reason, suggesting the post-Roman continuation of a pagan custom. A timber hall is built on the plateau, and a gate house is built on the south-west entrance to the enclosure. This is some considerable distance from the site of the hall, giving a level of authenticity to the Arthurian stories such as Culhwch and Olwen, where Culhwch arrives at the gate house but the gate keeper refuses to make the journey to the hall where his lord is already sitting down to eat. The hall is a hundred metres (yards) away, up a steep slope, so the gate keeper's refusal at the end of the day, and especially if it is raining, is understandable. A new system of defences is established, superimposed on the top bank. It consists of a wall that is about five metres (sixteen feet) thick which encircles the entire perimeter of 1.2 kilometres (about three quarters of a mile). The work consists of unmortared stone and incorporates pieces of Roman masonry, all of which is bound by wooden beams. The various breastworks, platforms and watchtowers have not survived to be studied. The structure is Celtic in style, and fairly sophisticated, and must call on considerable labour to build it. Ambrosius Aurelianus? Prince Riotham of Dumnonee? Riothamus, 'King of the Britons', crosses the Channel to Gaul, bringing 12,000 ship-borne troops. 'Riothamus' is a title rather than a name, apparently meaning 'supreme king', which raises the possibility that he is Ambrosius Aurelianus. Whoever the owner of Cadbury Castle might be at this time, he is clearly a very powerful man, which places Ambrosius, Riothamus, and even Arthur as very strong contenders for the role. Datable to this period are finds of high quality non-British pottery which is used for expensive goods such as wine and oil, which has been imported from the eastern Mediterranean. Its presence here implies occupation by a household of wealth and standing, and very likely a princely or royal household, at more or less the time of Arthur. Dux bellorum, 'battle leader'. Possible emperor of Britain. The existence of Arthur as the British battle leader is highly controversial, but given the odds, and all the early material that contains appearances by him, his existence is more likely than not. Just as controversial is the existence of Camelot as Arthur's personal headquarters (as opposed to being the country's administrative centre). Cadbury Castle is by far the best candidate for the role, and its location in the modern county of Somerset would place it within the borders of Dumnonia at this time. Traditionally, Arthur's wife is Guinevere, a medieval form of a Cornish name that is probably Veneva (and which descends as the modern Jennifer). She is a princess of Dumnonia, and possibly a sister to King Gerren. It seems reasonable that Arthur would find a home in the land of his wife (especially given his own, again traditional, origins in distant Armorica). Some say that, when Arthur has gone, the 'evil King Mark of Cornwall' marches on Camelot and destroys it. This would be Cyn-March ap Meirchion of Cornubia, but his reputation for being evil is a far later addition in the Tristan & Iseult romance. In fact the site remains in use until around 580, which would tie its abandonment very closely to the fall to the West Seaxe of the three cities of Caer Baddan, Caer Ceri, and Caer Gloui in 577 and the lost of much of the region to the invaders.